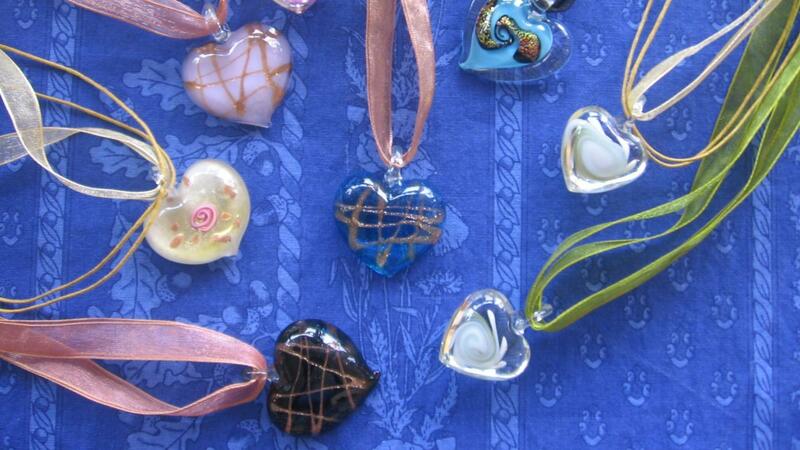 How Do You Make Fused Glass Pendants? There are many ways to make fused glass pendants, and the easiest involves placing a piece of fiber shelf paper between two identical glass pieces, fusing the glass in a kiln and stringing a cord or chain through the cooled pendant. The required supplies are fiber shelf paper, two identical pieces of colored glass, scissors, a soft cloth, a glass kiln, a kiln-washed shelf, a toothpick and a cord or chain. Each pendant takes roughly 10 minutes to assemble; the firing and cooling times depend on the kiln size and manufacturer. Cut a piece of fiber shelf paper that measures 1 inch by 1/8 inch by 1/8 inch. Select two identical glass pieces that are 3/4 inch long and 1 1/2 inches high. Polish the pieces with a soft cloth. Lay one glass piece on a flat surface. Set the paper strip on top, about 3/8 inch from the top edge. Place the second glass piece over the paper. Set the glass stack on a kiln-washed tray, and insert it into the kiln. Watch the pendant through the kiln's viewing window, and remove it when the top piece of glass folds over the fiber paper. Turn off the kiln, and wait for it to return to room temperature. Remove the pendant, and poke a toothpick into one end of the fiber paper strip. Push on the toothpick until the paper pops out of the pendant. Thread a cord or chain through the channel. How Do You Make a Yarn Pom Pom? How Do You Crochet Butterflies? How Do You Crochet Roses? How Do You Crochet a Flower Pattern? How Do You Make Miniature Figures? How Do You Draw Monsters? How Do You Make Leather Sandals? How Do You String Swarovski Suncatchers? What Are Some Common Crochet Stitches? How Do You Make Flowerpot Men? What Are Some Common Abbreviations Used in Crochet?